The Proceedings contain accounts of trials which took place at the Old Bailey, London's principal court for trying those accused of felonies. The first published collection of trials at the Old Bailey dates from 1674, and from 1678 accounts of the trials at each sessions (meeting of the Court) were regularly published. Inexpensive, and targeted initially at a popular audience, the Proceedings were produced shortly after the conclusion of each sessions and were initially a commercial success. But with the growth of newspapers and increasing publication costs the audience narrowed by the late eighteenth century to a combination of lawyers and public officials. The Proceedings were published between 1674 and 1913. The full run of the publication is available on a separate but related website, the Old Bailey Online, whereas only those published until 1820 are included in London Lives. The advantage of using the Proceedings within London Lives is the ability to link them to related records from other archives. The content of the texts is the same on both websites. This page provides information about the publishing history of the Proceedings, their value as a historical source, and their relationship with the other sources on this website. More information is available on the About the Proceedings pages of the Old Bailey Online. News From Newgate. 1674. © Harvard University Library. OBP ref: f16740429-1. In the 1670s, perhaps as a result of growing concern about crime, there was an explosion of crime literature targeted at a popular audience, including criminal biographies, the Ordinary of Newgate's Accounts of the lives of condemned criminals, last dying speeches, and trial accounts. The first surviving published account of a group of trials which occurred at the Old Bailey (as opposed to accounts of notable single trials) was from the April sessions of 1674. 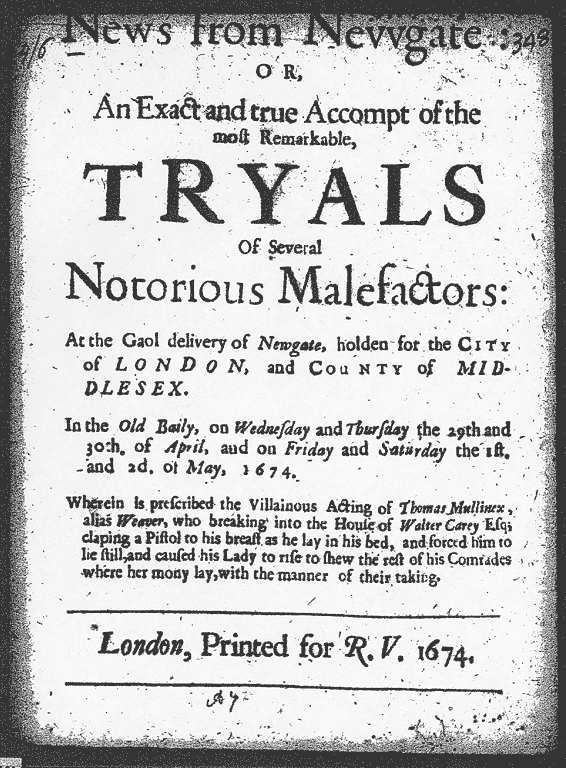 Entitled News from Newgate: or an exact and true accompt of the most remarkable tryals of several notorious malefactors... in the Old Baily, this pamphlet, like many early editions of the Proceedings, described only some of the trials which took place at that sessions. As this pamphlet concluded, in addition to those reported there were also "divers other tryals which would be too tedious to insert". Editions survive for most sessions in the late 1670s, but were produced by a number of different publishers. On occasion, as in January 1676, two competing accounts were published of the same session. These early Proceedings were similar to earlier chapbooks with their sensationalist and judgemental approach, and they were very selective in the trials they chose to publish. The Proceedings on the King’s Commission of the Peace. January 1715. © Harvard University Library, LL ref: f17150114-1. In October 1678 the first edition which described all the trials at a single session appeared. In December 1678 a particularly detailed account was published with a more objective tone. Perhaps in recognition of what such publications could achieve, and in order to have some control over their content, in January 1679 the Court of Aldermen of the City of London ordered that accounts of proceedings at the Old Bailey could only be published with the approval of the Lord Mayor and the other Justices present. At this point a more or less standard title was adopted: The Proceedings of the King's Commission of the Peace and Oyer and Terminer, and Gaol-Delivery of Newgate, held for the City of London and the County of Middlesex, at Justice-Hall, in the Old Bailey. With some minor variations, this title remained unchanged for decades. Although sometimes referred to as the "Sessions Papers", this website uses the short title of Old Bailey Proceedings, or just Proceedings, to distinguish these printed accounts from the related but distinct record type, manuscript Sessions Papers (PS) which are also available on the London Lives website. Early editions of the Proceedings were between four and nine pages long, included brief summaries of trials, and were not necessarily comprehensive. Nonetheless, by the mid-1680s most trials seem to have been reported. Around 1712 the Proceedings began to include some verbatim testimony, especially in trials which were thought to be salacious, amusing, or otherwise entertaining. By this point the Proceedings was an established periodical, read enthusiastically by Londoners seeking news, moral instruction, or entertainment. Although there is no evidence that publication was interrupted, it is not clear whether publication was constant throughout the period from 1678 to 1714. Whereas editions survive for the vast majority of sessions between April 1674 and 1698, between 1699 and 1714 editions are missing for two-thirds of the sessions, and there are three years for which no Proceedings survive: 1701, 1705, and 1706. The Proceedings at the Sessions of the Peace, and Oyer and Terminer, for the City of London and County of Middlesex. December 1729, LL ref: f17291203-1. In December 1729 the publisher introduced a number of changes to the format in order to make the Proceedings more attractive to readers, in the face of competition from daily newspapers and published compilations of trials. They were expanded to twenty-four pages, and included yearly indexes, cross-referencing between trials, advertisements at the back, and, most importantly, much greater use of verbatim accounts of the testimony of prosecutors, witnesses and defendants, as well as judges' comments and questions (this was facilitated by the use of shorthand note-takers). 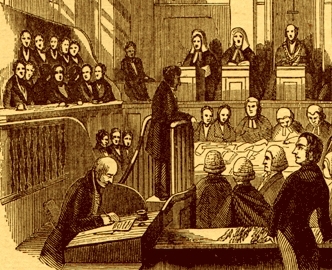 Ordinary trials were still treated very briefly, in order to allow more space for accounts of the more exciting trials, including murders, sexual crimes, and thefts from the person (which usually involved prostitutes). Although still a commercial enterprise, there is evidence that the Proceedings were beginning to be viewed as providing a legal record of the court’s proceedings. Evidence of their growing respectability (and probably declining readership) can also be seen in the decreasing number of advertisements (with the exception of those for the shorthand writers who took notes at the trials) in the 1740s. By the late eighteenth century, public interest in the lives of ordinary criminals was waning. The Proceedings came to provide much less sexually explicit testimony and the number of trials reported increased significantly. At the same time, accounts of what happened at the Old Bailey were reported in increasing detail in the newspapers. For all these reasons the Proceedings ceased to be commercially viable and in 1787 a subsidy had to be paid by the City of London to ensure their continued publication (earlier, publishers had paid the City for the privilege of publishing the Proceedings). In 1775, the City began to take a greater interest in controlling the content of the Proceedings, and in 1778 it demanded that the Proceedings should provide a "true, fair, and perfect narrative" of all the trials. In part, this requirement resulted from the fact the Proceedings were being used by the Recorder (the principal legal officer in the City) as a formal record: they formed the basis of the Recorder's report to the King concerning whether the convicts sentenced to death should be pardoned or executed. Moreover, at a time of social instability, the City was concerned to demonstrate to the public the fairness and impartiality of judicial procedures at the Old Bailey. As a result of this increased scrutiny and new demands from the City, the length of the trial reports increased and some of the techniques publishers used to sell copies were abandoned. The practice of providing considerable detail of the more entertaining crimes while providing only brief details of others ceased, and all trials now received more or less uniform treatment. From this point the Proceedings became essentially an official publication of the City, though they continued to be produced by a commercial publisher. They were now provided less for the purpose of entertainment than as a means of keeping an accurate public record of events which transpired in the courtroom. 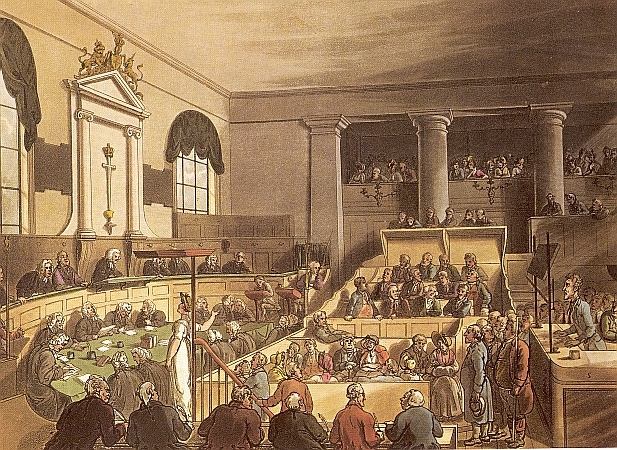 Their commercial viability was increasingly undermined by their length and detail, and in the 1780s publishers began to target the Proceedings at a legal audience, taking advantage of the increasing number of lawyers present at the Old Bailey. Despite their limited audience, the Proceedings continued publication until 1913. For their later history, see the Old Bailey Online. Reporting the Proceedings, 1842, from Walter Besant. London in the Nineteenth Century (1909). © reproduced courtesy of and with thanks to the University of Sheffield. Many types of information were regularly omitted, notably details of defence testimonies, legal arguments, and the judge's summing up. For this reason, one should not argue from silence - one should not conclude that because something was not reported in the Proceedings, it was not said or did not occur in court. The case for the defence was most affected by these omissions. In comparison to the case for the prosecution, testimony by the defendant, his or her counsel, and defence witnesses was more likely to be abridged or entirely omitted, especially when the defendant was acquitted. This had the cumulative effect of making those tried at the Old Bailey seem more culpable in the Proceedings than they appeared in court, and can make it difficult to understand why so many defendants were acquitted. Because the Proceedings sought to represent convictions and punishments as justified, less attention was paid to defence arguments. It is, therefore, important to take advantage of the fact that many other historical documents, both published and unpublished, survive for many of the cases tried at the Old Bailey. Although the Proceedings are available on a separate website, the advantage for those interested in eighteenth-century London history of using them within the London Lives website is that they can be consulted alongside associated records from other archives, and the related documents can be linked together. In particular, three record series are directly related to the Proceedings. The manuscript Sessions Papers (PS) include depositions, informations, and other documents containing the testimonies and correspondence of witnesses, victims and the accused before the trial. Although these documents do not survive for every trial, those which do often provide rich evidence, including material which was not repeated in the courtroom, or, if it was, was not reported in the Proceedings. For the period from 1676 to 1772, the Ordinary's Accounts (OA) provide biographies of the defendants convicted at the Old Bailey who were executed at Tyburn. Not only are these life stories often richly detailed, but the Accounts indicate whether a death sentence was actually carried out. For the period from 1791, the Criminal Registers (CR), lists of prisoners held at Newgate prison, often provide information about the accused which cannot be obtained in the Proceedings, including physical descriptions of the prisoners and their places of birth. One also learns the dates they were imprisoned and discharged, or if they died in prison. Of particular value is information about the actual punishment carried out on those convicted; since the Proceedings only provide information on the punishment sentence, they do not indicate if a convict was subsequently pardoned or if the punishment was actually carried out. Since everyone tried at the Old Bailey was a prisoner in Newgate at the time, all Old Bailey defendants should be found in the Criminal Registers, but the reverse is not true, since the cases of some of those committed to Newgate were dropped before trial. Persons appearing at the Old Bailey also appear in many of the other document types included on this website, as can be discovered by combining the Proceedings with any other document type using the Person Name and Keyword search pages. Other relevant documents which survive but are not included in this website include prosecution briefs, correspondence relating to the pardoning process (including petitions and judges' reports), and registers of convicts who were transported or incarcerated in the hulks. These can be identified using the Associated Records database. Harris, M. Trials and Criminal Biographies: A Case Study in Distribution. In Myers, R. and Harris, M., eds, Sale and Distribution of Books from 1700. Oxford, 1982. Devereaux, S. The City and the Sessions Paper: "Public Justice" in London, 1770-1800. Journal of British Studies, 35 (1996), pp. 466-503. Devereaux, S. The Fall of the Sessions Paper: Criminal Trial and the Popular Press in Late Eighteenth-Century London. Criminal Justice History, 18 (2002), pp. 57-88. Langbein, J.H. The Origins of Adversary Criminal Trial. Oxford, 2003. Shoemaker, R.B. The Old Bailey Proceedings and the Representation of Crime and Criminal Justice in Eighteenth-Century London. Journal of British Studies, 47 (2008), pp. 559-580. This website includes all surviving editions of the Proceedings published between 1680 and 1820, but excludes publications which only report a single trial. See the Old Bailey Online for a comprehensive collection of all known editions, 1674 to 1913. Approximately a third of the Proceedings are missing for the period from 1674 to 1714, after which a continuous series survives. See the Old Bailey Online for a full list of surviving editions.